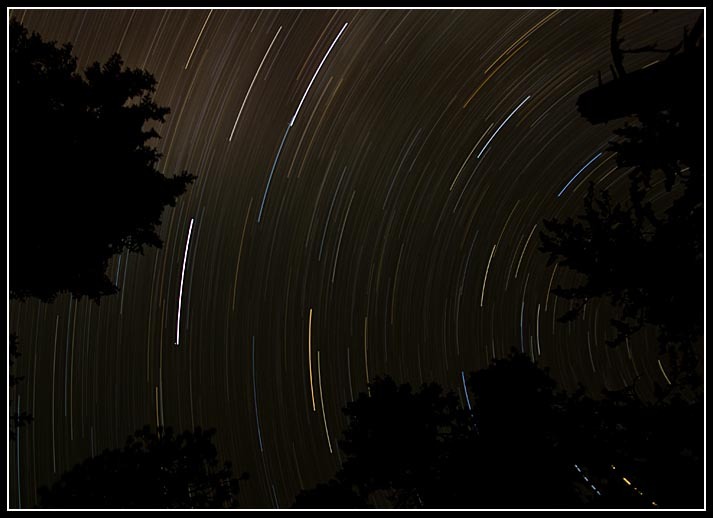 For a long time I've wondered how my DSLR would get along with star trails. How long would the battery last and how would the sensor handle the noise? Start trails are always something I mean to do but never actually get around to trying; probably because it involves not going to sleep, which is something I enjoy quite a bit. If I am in the mood to do star trails it's invariably cloudy or there's a full moon. Either that or I don't have fully charged batteries. About 6 months ago I gave it a go as a test when I was on vacation in Arizona but one of my batteries was dead and after about 10 minutes into the exposure on my fresh battery I realized that my car charger had failed and if I wasn't careful I was going to end up with 2 dead batteries and no way to charge them for a few days. I stopped the exposure at 15 minutes and although it seemed to have came out ok it was tough to tell with the relatively short exposure, plus a few clouds had moved in during the exposure. It was a pretty boring shot so I deleted it, otherwise I'd show it here. Cut to a couple nights ago when I was camping on a mountain in the Cascades on a beautifully clear night. The stars were shining brightly and I knew I had one nearly full battery and one fully charged battery. I stuck the fully charged battery in the camera and decided to give it another go. Of course I'd waited too long so trying to compose and focus were no easy task in the dark (the infinity setting on the 16-45/4 lens isn't actually in focus at infinity). I set the lens to f/4@100 ISO. I waited until the sun had been set for about 2 1/2 hours and figured I'd give it a 1 hour exposure to see if the battery would last that long and how bad the noise would be. I put the camera on the bulb setting, locked it open with my wired remote, and read my book for an hour. I was happy to go back to the camera 1 hour later and hear the mirror thunk down when I released the shutter. The battery had survived so far; now lets see if it would last through the dark frame subtraction. In case you aren't familiar with dark frame subtraction it's used in digital cameras to help eliminate the noise that creeps in during long exposures. For example, if you shoot a 1 second exposure then just after taking the shot the camera will make another 1 second exposure on its own; but it won't raise the mirror or open the shutter so the sensor isn't actually exposed to light. Any 'light' that shows up during this totally black exposure is interpreted as noise by the camera and it subtracts that noise from the affected pixels in the original exposure. Not an exact science but a help. So back to my start trails. I checked my watch and was curious to see how long the battery would last into the dark frame and if the dark frame would actually last an hour, the same amount of time as the exposure. Happily the battery lasted without problem and interestingly enough the dark frame only lasted about 50 minutes. The results of the picture turned out better then I'd expected, though in hind site I wish I would have set the lens to f/5.6 instead. I darkened this shot a little in post processing. So it's a start but I need to do some more experimenting. Will the battery last for 1 1/2 hours? 2 hours? Is 50 minutes the maximum time the dark frame will last or will it go longer with a longer exposure? Will the noise ever get to the point where it's really bad or will it be acceptable. Once I figure out the max the battery will last maybe I'll have to get a portable, external power source for the camera to try some really long exposures. I figure by the time the year is up I'll have made my second test exposure and it a few years I should pretty much have all the variables worked out. By then it will be time for me to replace my DSLR and start all over again. Anyone else have any experience with star trails and DSLR's that can save me some time? I don't have a lot of experience with extremely long exposures but you might consider the D-BG2 battery grip for the K10D so you can use two batteries (I imagine you already have at least two batteries). This is probably one of the more convenient solutions but there are probably less expensive and possibly more effective jerry-rig solutions for external power. I'm wondering if you could post something on the cable release and how you managed to get it to lock the shutter open for an hour? Just a standard electronic cable release, as far as I know they all do it. I got mine for something like $10 on EBAY.